Since the project started, SSL has had to use traffic disruptions as part of the various operations involved in the construction of the New Champlain Bridge Corridor. They are used to clear work areas, make room for equipment on-site and allow crews the space they need to work safely. Over the next few months, major road disruptions are expected, including those on L’Île-des-Sœurs, to allow workers to continue the reconfiguration of Hwy-15 so motorists can access the future Champlain Bridge. Whenever you see a disruption, usually with orange pylons and a partial or complete closure, this is the result of a whole collaborative process among all of the main technical partners, which makes decision-making easier. “Whenever construction work calls for a traffic disruption, there are two core principles that guide all of our decisions: the safety of users, residents and workers, and the flow of traffic. The aim of our Mobility team is always to work with our other technical partners to find a solution that meets these criteria. We have to take into account nearby work sites as well, to coordinate our efforts. There are months of careful planning before you finally see the disruption in place and construction work begins,” explains Geneviève Campeau, Operation Maintenance and Mobility Manager. 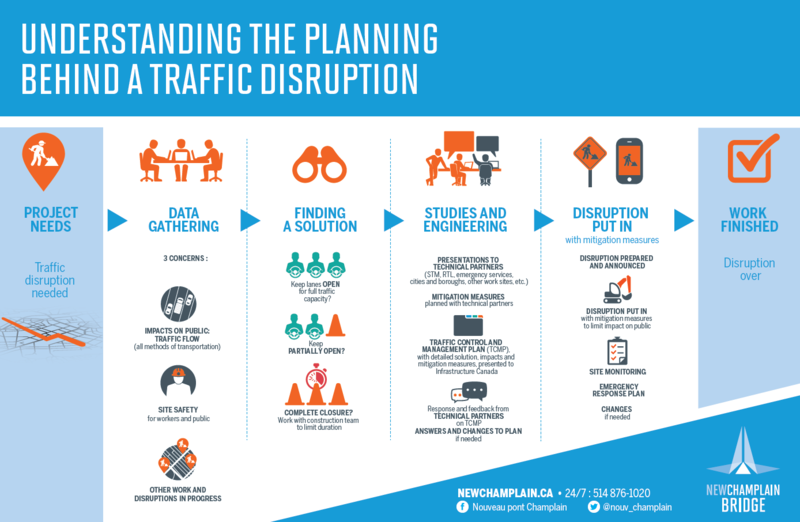 To help you better understand the various steps leading up to a traffic disruption, Signature on the Saint Lawrence has created an infographic with more details on the process and the work of our Mobility team.